There are days when my sweet tooth gets the best of me, when I’d love to just sit down and gobble up every last brownie in the pan. But I know I can’t. My waistline would take several days to forgive me, not to mention my chocolate loving husband and offspring. So I settle for two, or possibly three, and leave a few squares in the pan for the rest of the family. And then there are days when my craving for something crisp, with a tart and snappy attitude, kicks in. 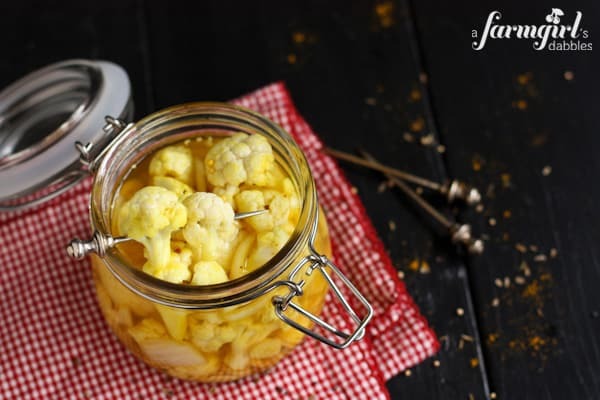 That’s when I reach for a jar of homemade pickled vegetables, such as Pickled & Peppered Asparagus, my mom’s quick and easy Sweet Refrigerator Dill Pickles, or this Pickled Curry Cauliflower. I know I can indulge to my heart’s content, much more guilt-free! I have made a complete turnaround over the past year in my view of cauliflower. (It used to be on my “blech!” food list.) Sylvie’s savory recipe with olives (awesome!) is what got me started. Then I moved on to roasted cauliflower with sweet raisins and orange…and then sauteéd and curried with a mix of couscous and grains. ALL awesome! 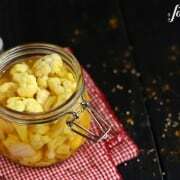 This pickled curry cauliflower is bright and sassy, with a bit of a warm bite from the curry. Its fresh crunch makes for a fun appetizer or salad topper, and is awesome alongside a warm grilled sandwich or a plate of eggs with a slice of buttery toast. It also constitutes a simple tasty lunch, all on its own, straight from the jar. In a large nonreactive saucepan, combine the vinegars, water, salt, and sugar. Bring to a boil, stirring until salt and sugar are dissolved. Remove from heat. 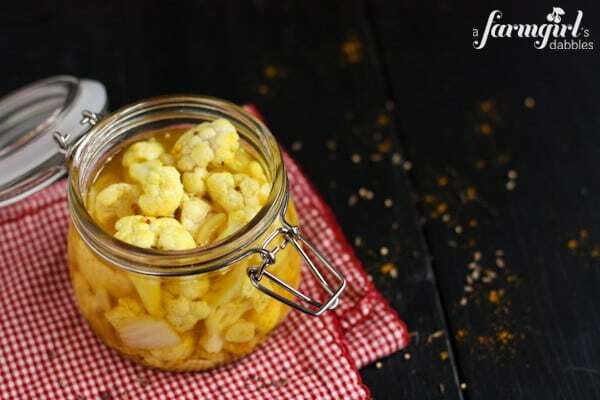 Place enough cauliflower, packed tightly, into each of the three 1-quart jars to fill the bottom fourth of each jar. Then add garlic, cumin seed, brown and yellow mustard seeds, dill seed, and curry powder to each jar. Divide the fresh sliced onion between the 3 jars. 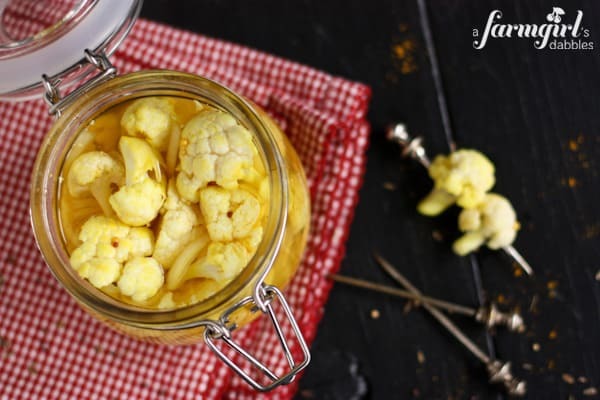 Then tightly pack each jar with cauliflower, leaving 1/2” headspace at the top of the jar. Pour hot vinegar mixture over the cauliflower, leaving 1/2” headspace and making sure the cauliflower is covered in liquid. Clean off the rims and screw on airtight lids, making sure your lids are on very securely. Then invert jar and shake to distribute all the delicious goodness. Refrigerate for at least 24 hours to allow flavors to mingle. I found them to be even better after waiting 4 to 5 days. Store in refrigerator. Eat within 3 weeks.